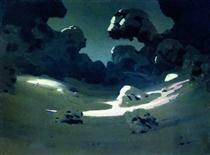 Arkhip Ivanovich Kuindzhi (or Kuinji; Russian: Архи́п Ива́нович Куи́нджи pronounced [ɐrˈxʲip kʊˈindʐɨ]; January 27, 1842(?) – July 24, 1910) was a Russian landscape painter of Greek descent. 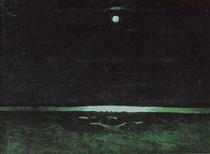 Arkhip Kuindzhi was born in January 1842 (1841?) in Mariupol (nowadays Ukraine) but spent his youth in the city of Taganrog. His Christian name is a Russian rendering of the Greek, Ἄρχιππος, (Archippos, from ἄρχος (archos) "master" and ἱππος (hippos) "horse": "master of horses"; cf. Colossians 4:17; ) and his surname came from his grandfather's vocational nickname meaning 'goldsmith' in Tatar (cf. Turkish, kuyumcu). 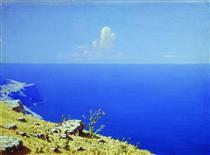 He grew up in a poor family; his father was a Greek shoemaker, Ivan Khristoforovich Kuindzhi (sometimes spelt Emendzhi). Arkhip was six years old when he lost his parents, so he was forced to make a living working at a church building site, grazing domestic animals, and working at the corn merchant's shop. He received the rudiments of an education from a Greek friend of the family who was a teacher and then went to the local school. 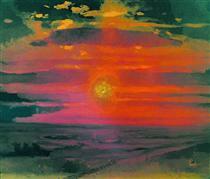 In 1855, at age 13–14, Kuindzhi visited Feodosia to study art under Ivan Aivazovsky, however, he was engaged merely with mixing paints and instead studied with Adolf Fessler, Aivazovsky's student. 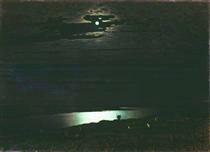 A 1903 encyclopedic article stated: "Although Kuindzhi cannot be called a student of Aivazovsky, the latter had without doubt some influence on him in the first period of his activity; from whom he borrowed much in the manner of painting." 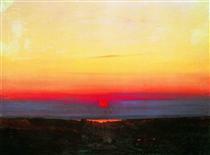 English art historian John E. Bowlt wrote that "the elemental sense of light and form associated with Aivazovsky's sunsets, storms, and surging oceans permanently influenced the young Kuindzhi." During the five years from 1860 to 1865, Arkhip Kuindzhi worked as a retoucher in the photography studio of Simeon Isakovich in Taganrog. He tried to open his own photography studio, but without success. 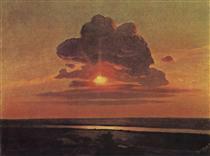 After that Kuindzhi left Taganrog for Saint Petersburg. He studied painting mainly independently and at the St. Petersburg Academy of Arts (from 1868; a full member since 1893). 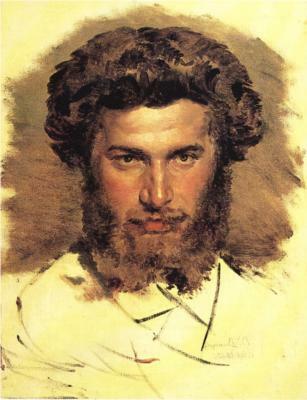 He was co-partner of traveling art exhibitions (Peredvizhniki), a group of Russian realist artists who in protest to academic restrictions formed an artists' cooperative which evolved into the Society for Traveling Art Exhibitions (Peredvizhniki) in 1870. 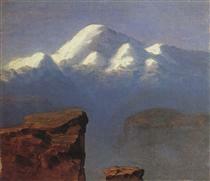 In 1872 the artist left the academy and worked as a freelancer. 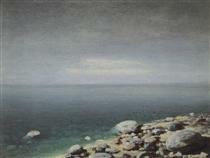 The painting On the Valaam Island was the first artwork which Pavel Tretyakov acquired for his art gallery. In 1873 Kuindzhi exhibited his painting The Snow which received the bronze medal at the International Art Exhibition in London in 1874. 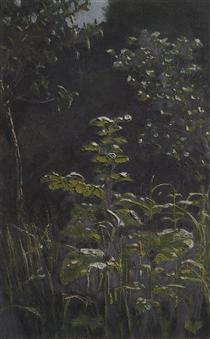 In the middle of the 1870s he created a number of paintings in which the landscape motif was designed for concrete social associations in the spirit of Peredvizhniki (Forgotten village, 1874; Chumatski path, 1875; both – in the Tretyakov Gallery). 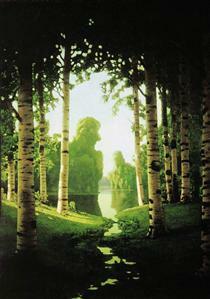 In his mature period Kuindzhy aspired to capture the most expressive illuminative aspect of the natural condition. He applied composite receptions (high horizon, etc. ), creating panoramic views. 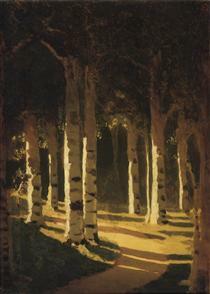 Using light effects and intense colors shown in main tones, he depicted the illusion of illumination (Evening in Ukraine, 1876; Birch Grove, 1879; After a thunderstorm, 1879; all three are in the Tretyakov Gallery; Night on the Dnepr, 1880 in the Russian Museum, St.Petersburg). His later works are remarkable for their decorative effects of color building.